I've always thought the B ran a little hot and it's always been on my mind, especially when stuck in heavy traffic. One of the things I've been wanting to do is give the radiator a flush out, just to settle my mind that it isn't at fault. I'd already purchased an infrared thermometer and tested all the 'hot' locations and they all came in under 90 degrees C, but I was hoping I could get them cooler. Whilst we have replaced the water in the radiator a couple of times, for example when we replaced the hoses, I wanted to do a back-flush to see what it might dislodge. 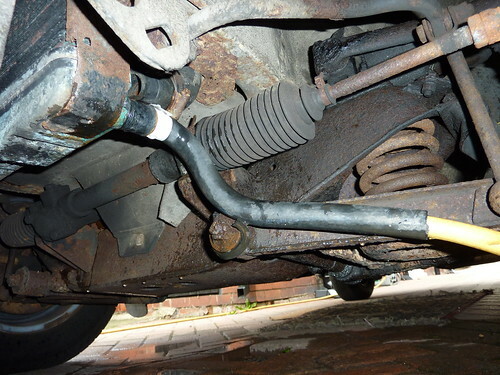 For this I only wanted to concentrate on the radiator, rather than the engine block or the heater, so I disconnected the bottom hose and after it had drained a little, disconnected the top hose too. The trick then is getting a good enough seal at the bottom to allow enough pressure from the hose for the water to do its job of dislodging any crud. Luckily we had an old rubber pipe from another car laying around the garage which turned out to be a perfect fit for the garden hose at one end and with a bit of plumber's tape fitted snugly into the bottom radiator opening (see photo). After all that, the water which came out was as clear as a bell, so short of doing a hot chemical flush it would appear that the radiator is not contributing to any extra heat.